Stem is a collection of minimal lighting featuring lit spheres of handblown Czech glass on brass armatures. The spherical glass diffusers feature the signature SkLO double-dipped, fire-polished mouths which show where the glass is broken from the blower’s pipe, making each unique. 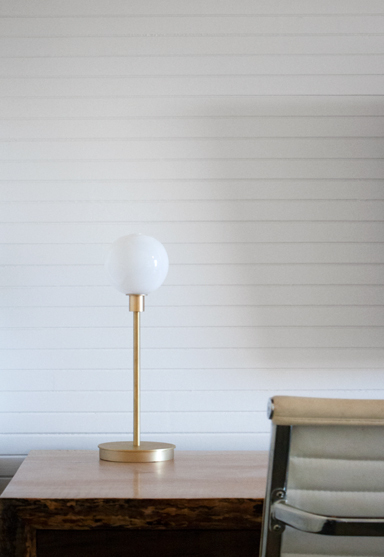 Stem table is a minimal table lamp, featuring either a single (stem 1) or a double set (stem 2) of lit spheres, presented on a sturdy handmade brass base. Spheres are 4 1/2″ (11cm) diameter. Socket(s): 120V E12 (candelabra) 7W max (G9 sockets available on request).